Over the knee boots are loved by the world and celebrities alike - which means of course we are obsessed too! 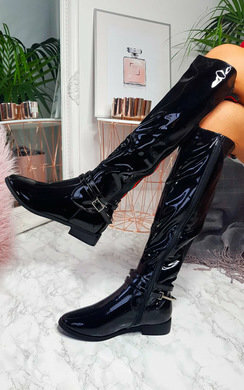 The likes of Gigi Hadid, Kim Kardashian and Selena Gomez are always bang on trend when wearing over the knee boots - their stylish and chic outfits makes us need these in our life even more. Thigh high boots are great for many reasons. Firstly, you can gain instant style points as soon as you put them on. They are a great type of boot for making an outfit stand out. Flat styled ones are perfect for styling over jeans and wearing a casual t-shirt with for day to day life. 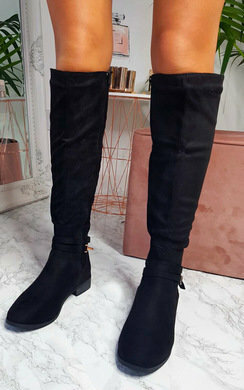 Heeled boots are amazing too as they can be great to wear with mini dresses and jumper dresses depending on your mood. The heel allows for it to be a little bit dressier with height but not too glam as you would look with heels. We have many styles from faux suede, faux leather and stretch fabric. Details can make all the difference from fur pom poms, gold bar detailing, a diamante finish and studs. We have all styles for if your wanting to be a girly girl, something a lil grunge or if your wanting to look fierce. Make sure to check out our great range of over the knee boots now! You will not regret it. Treat yourself, you deserve it after all! And make sure to head to our clothing section right after so you can start to style out your new picks.